Russia and China once again blocked the UN resolution condemning Syria and have been severely criticised by the West. Yet experts view this stance as reasonable. The West condemns the move by Russia and China to veto the UN resolution on Syria. Critics include British Foreign Secretary William Hague and the French President Nicolas Sarkozy. UN Secretary-General Ban Ki-moon said the lack of unanimity in the Security Council undermined the United Nations’ image. U.S. Secretary of State Hillary Clinton called the failed UN Syria vote a “travesty”. The resolution, which is being actively pushed through by the United States and its allies, is further interference in the internal affairs of a sovereign nation, said Vitaly Churkin, Permanent Representative of Russia to the United Nations. “Since the onset of the Syrian crisis, some influential members of the international community, including those sitting at this table, have undermined the possibility of a political settlement, calling for a change of regime, inciting the opposition against the authorities, resorting to provocation and encouraging armed struggle. 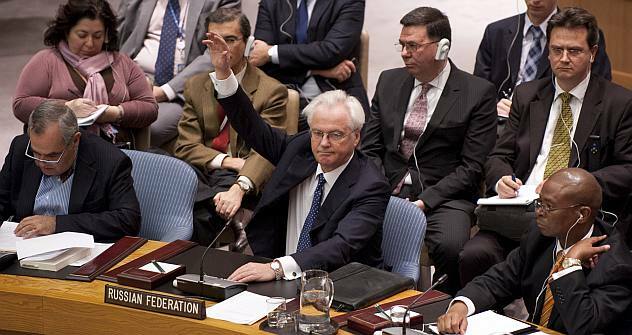 We deeply regret such a result of our joint efforts in the Security Council”, Churkin said. His Chinese counterart Li Baodong echoed his view. “The actions of the UN Security Council on the Syrian issue must comply with the provisions and principles of the Charter of the United Nations and promote reduced tension, political dialogue and resolution of disputes, maintenance of peace and stability in the Near East, instead of complicating the situation,” he said. “The United States is disgusted that a couple of members of this Council continue to prevent us from fulfilling our sole purpose here – to address the ever-deepening crisis in Syria. This council has been held hostage by a couple of members. These members stand behind empty arguments and individual interests while delaying the talks”, Rice said. The U.S. and its allies are pursuing their own interests in Syria, which do not coincide with Russia’s interests, according to Evgeny Satanovsky, president of the Near East Institute. On Tuesday, heads of the Russian Foreign Ministry and foreign intelligence service are leaving for Syria. Sergey Lavrov and Mikhail Fradkov are expected to meet with Bashar Asad in Damascus. Asad is not the key player in this matter, according to Said Gafurov, head of research at the Russian Society for Oriental and African Studies. In the meantime, clashes continue in Syria and some experts are calling them a civil war. The confrontation has reached countries that have Syrian communities. Syrian embassies are under attack in Australia, Egypt, Germany and the United Kingdom. After the failed vote, Russian diplomatic missions have become new targets for attack.